Checkout The C-VUE Contact Lenses! 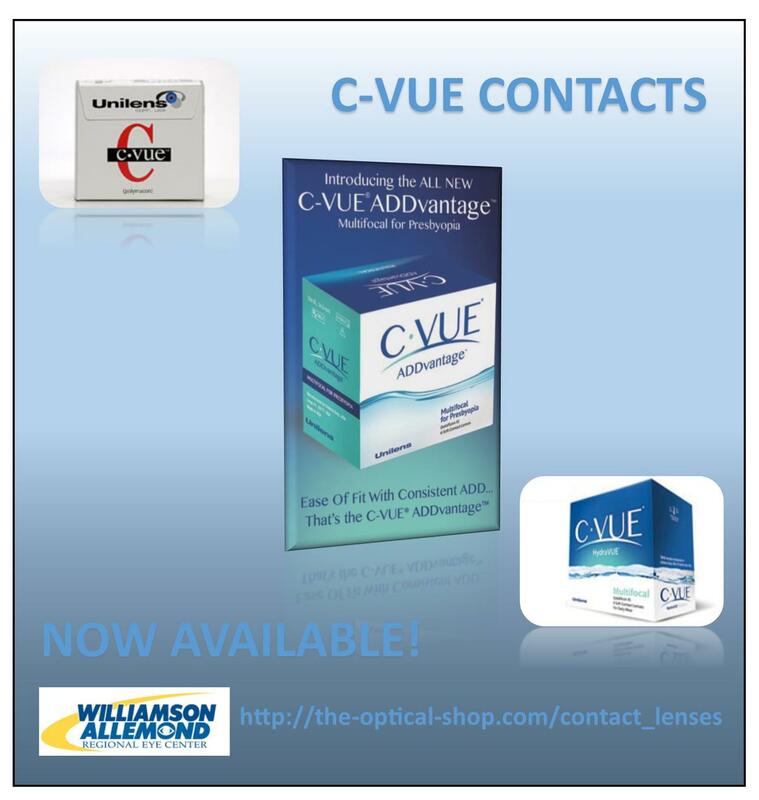 The Unilens C-VUE brand contacts is one of our most popular selling contacts! The monthly disposable C-VUE lens is Unilens’ most successful multifocal product. It is an aspheric soft contact lens that provides near, distance and intermediate vision correction. It is available in high and low ADD versions, and it even features a blue visibility tint. It is very cost efficient and comes in packs of six which are disposable each month. Dr. Jason Allemond prefers this lens because of the contact lens design, and it is the best material available today. With the C-VUE lenses, our doctors are able to fit patients who may not have had success wearing contact lenses in the past. Whether due to poor vision, astigmatism, comfort issues, or dry eyes, there are many other choices in contact lens materials to meet those particular challenges. The Toric lenses are made from the same materials as regular contact lenses but have a few extra characteristics. They correct both spherical and cylindrical aberration. In a contact lens eye exam, the Doctor will examine your eyes to determine if you can wear contact lenses. Your prescription is evaluated, and the curvature of your eye is measured, and the doctor determines any special needs you may have. The doctor will then decide the type of contact lenses that best fits your eyes and provide you with the most accurate vision while ensuring that your eyes remain healthy with the lens choice. If trial lenses are available in the office, you may be able to go home with lenses the same day. If you are interested in the C-VUE lenses or for any other contact lenses related needs, call the Williamson Allemond Regional Eye Center today! Our number is 225.654.1061! Click Here To Visit The-Optical-Shop Online! WELCOME MRS. STEPHANIE MURPHY, OUR NEW OPTICIAN! The Doctors and Staff of the Williamson Allemond Regional Eye Center in Zachary are excited and proud to announce and welcome back our former Optician, Mrs. Stephanie Murphy! 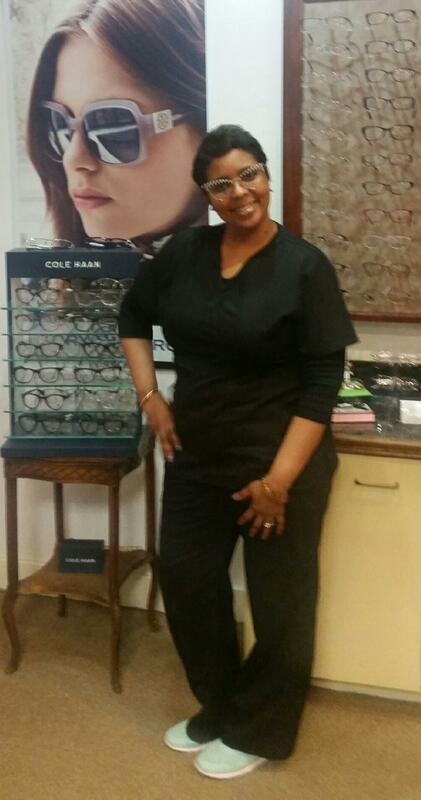 Stephanie has worked as a professional Optician in the Zachary area for many years. She is a great addition to The-Optical-Shop here at the Center, and we are super blessed to have her! So if obtaining a new pair of glasses is planned for your imminent future, feel free to stop on by and let one of our friendly, experienced, Optical Professionals help you make your selection that will not only give you superb vision, but will also give you a look that will turn heads too! The Louisiana sun is fixing come out soon as well! Be sure to ask about our deals on prescription sunglasses as your second pair! We look forward to seeing you soon! 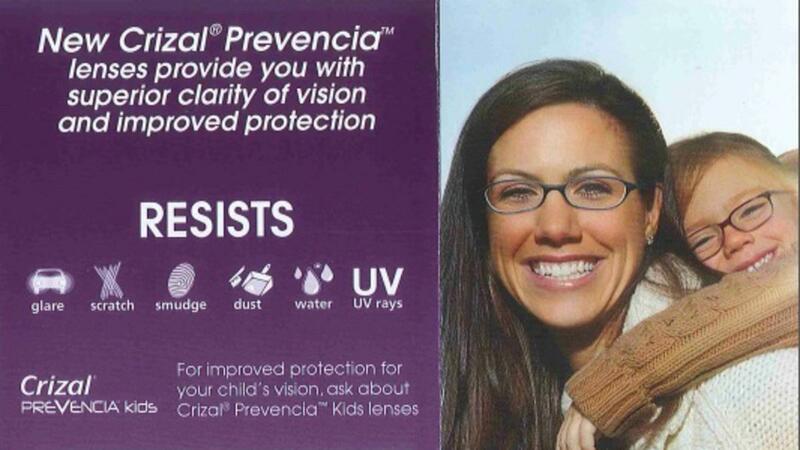 Crizal Prevencia - Glasses Lenses That Protect! Do you work on a computer for hours in a day? Do your eyes feel tired at the end of the day? Are you concerned about what UV (Ultraviolet) Light is doing to your eyes? How about Blue Violet Light or Light from your computer or handheld gadgets? Light plays a very important part in our everyday life. It helps us see shapes, details and even colors. It helps us regulate our sleep and wake cycle, our mood and other brain functions as well. As great as light is, it can also be harmful to your vision if your eyes are not protected properly. UV light damages your eyes just like it damages your skin. It accelerates the aging of your eyes just as well. Blue-Violet light can increase the risk for an early onset of age related macular degeneration (AMD). AMD mostly attributes to the loss of vision in adults over the age of 60. Where there are problems in relation to the human eye(s), the Williamson Allemond Regional Eye Center in Zachary has solutions! Let me tell you about our no-glare lens that can help protect your eyes from the harmful Blue Violet and Ultraviolet light! The Crizal Prevencia is a no-glare lens that allows Blue Turquoise light to pass through to preserve color perception, but it still provides 25 times more protection against damaging rays from the sun! It also deflects the harmful Blue Violet light to protect your vision, and this continues all day long. Your eyes will actually feel more rested at the end of the day. We have patient testimonies of this every week! Even the staff here at the Center has had the pleasure of this same benefit too! These special lenses are scratch, smudge, dust and water resistant too! The best thing of all is that they are very easy to clean! If you’d like to learn more about the Crizal Prevencia specialty lenses, call or come by! One of our Expert Opticians will be more than happy to help you. Call Or Come By Our Optical Shop! You Can Even Shop Online! CONGRATULATIONS TO OUR OBAGI GIFT BASKET WINNER! We are proud to announce the winner of our OBAGI Gift Basket give away! Mrs. Virginia was very surprised when we pulled her name! She said, “I never win anything!” When the call came in, she actually thought something was wrong! She was really lucky this time too! 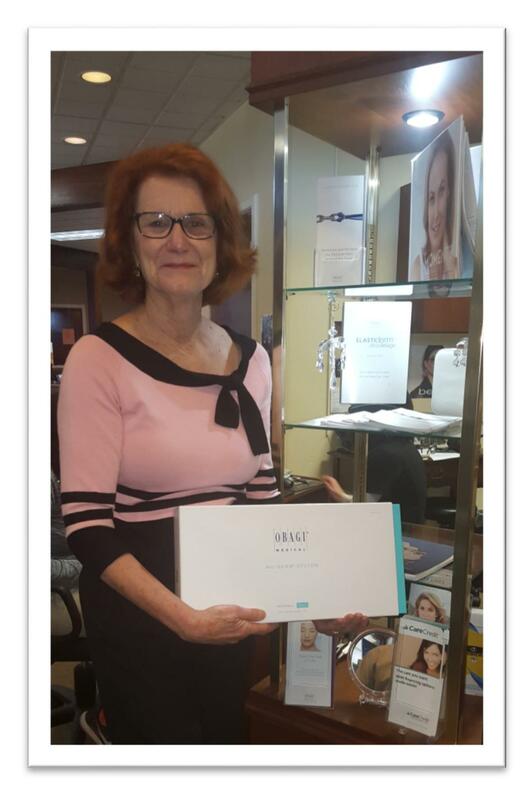 She received some of the best OBAGI Products we have to offer! Worth Over $ 400! Being an Eye Care & Cosmetic Center, we get so excited when our patients use our products and actually look and feel better! Some patients have more complicated problems that require injections and/or cosmetic surgery too, but in the end, our customers are satisfied and so are we! One of our favorite from the OBAGI collection is the ELASTIderm Eye Cream which reduces the appearance of fine lines and wrinkles around the eyes for firmer, more resilient-looking skin. Its sister product, the ELASTIderm Eye Serum, helps reduce the appearance of under the eye puffiness and it tightens the look of the delicate skin in the area. OBAGI Gentle Cleanser which is used to remove make up and clean the skin from impurities. OBAGI Toner which helps to balance the skin’s ph. OBAGI Hydrate is a moisturizing cream, and its used on areas where there is dry and flaky skin. We can’t wait to see the outcome of Mrs. Virginia’s skin from using our OBAGI Products! STAY TUNED FOR HER BEFORE & AFTERS! SHOP OUR OBAGI PRODUCTS NOW!